You can't properly do a corset for Mrs. Claus and not do something for Santa. It's just not right. So I thought and thought and came up with BLAHHH nothing. My mind is just in other places right now...sorry it just is. HOWEVER........I couldn't leave you with nothing for the big man. 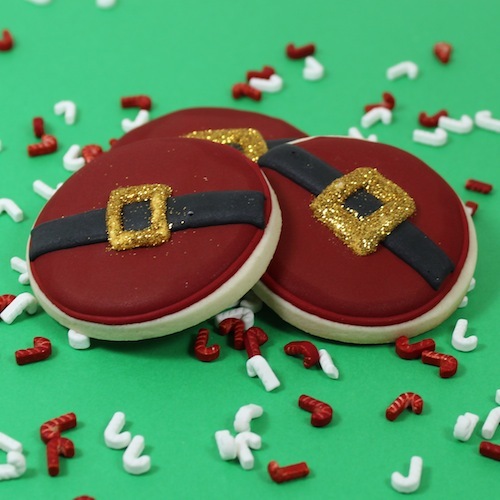 So I made Santa's belt on a round cookie. I know, I know, It's been done before in different forms. BUT, it's what I got okay. Sometimes we just all have similar ideas. When you think Santa, you think red and round right? SO....simple, yes a simple round cutter. If you cookie, chances are you have a round cutter. Take the round cutter and make some round cookies. SIMPLE right? Outline in red royal icing, then fill with a 15-20 second red icing. Add a belt with black royal icing and let dry for several hours. Add buckle with a yellow royal icing.....add gold disco dust and there you have it. SIMPLE Santa cookies. Now if you wanna get fancy hop on over to Sweet SugarBelle's and see what she's whipping up tomorrow. She's going to take you step by step to make some adorable Santa cookies at Katrina's Kitchen. But that's tomorrow. Today you just have me and you are stuck with my simple Santa belts. Good things are to come though. I've got some really cute cookies coming using my ornament cutters from Fancy Flours. 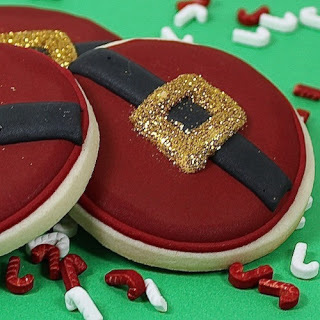 I love these cookies, they are not difficult to do but they do evoke all kinds of fun images of the season. Love the glitter on the belt buckle.